It's the most wonderful time of the year. That's right, I said it. Fall is upon us. That means that all the pastels are going back into the brightly lit, floral holes they crawled out of back in March. Bring on the wines, the hunter greens, the deep navy blues! 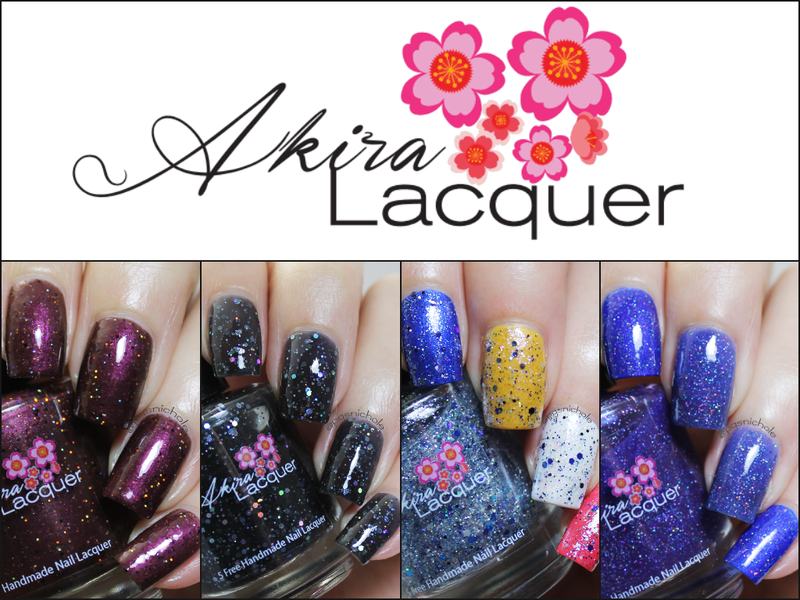 My first step into Fall is from Akira Lacquer. She's offered up a small but diverse collection this time...and I already have a favorite. 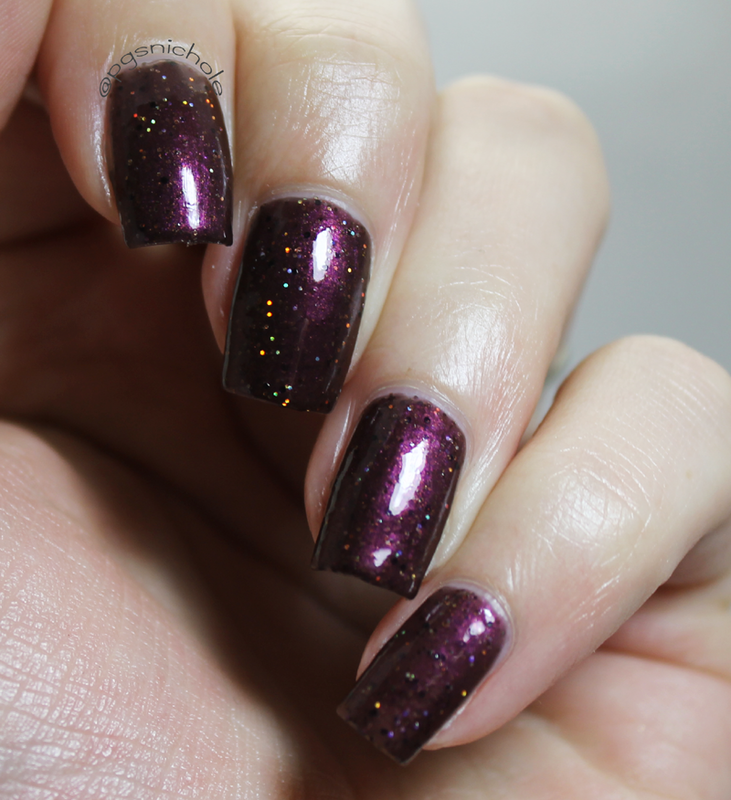 A lovely, rich metallic wine flush with black and holographic glitters. It took me more tries than I'm willing to admit to photograph this right...that holo is so unexpected in a color like this and I love it. The only drawback is that it is a tiny bit thirsty...not "seche + gelous + seche" thirsty, but without top coat it does have a slight texture to it. The fabulosity of the color more than makes up for that, I promise! So...this is my favorite. Yeah, I am predictable. 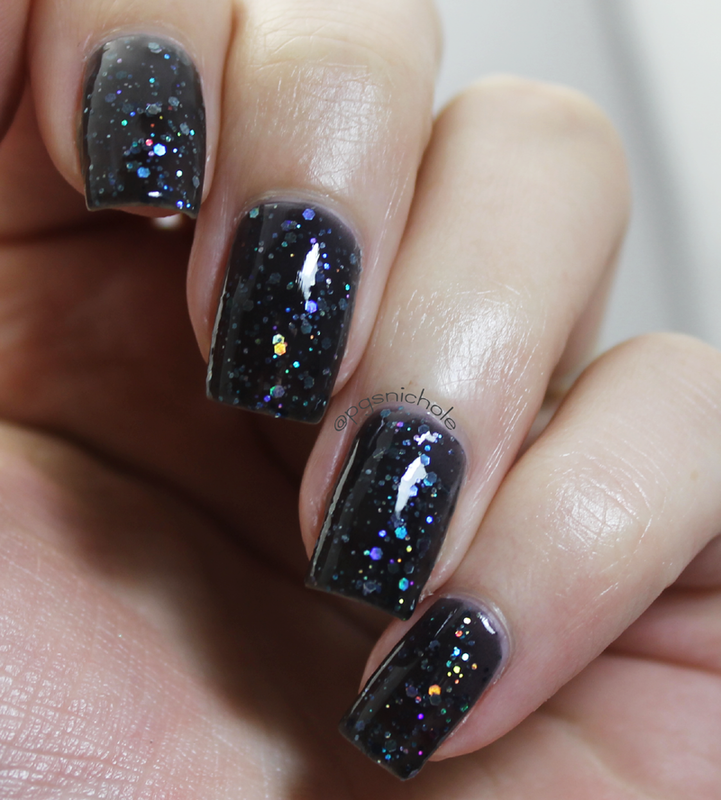 How can you not fall head-over-heels for a beautiful black jelly packed to the gills with glitter? I mean, really. Application was beyond wonderful, and I barely needed a top coat here. Another flawless victory in the jelly department for this line. If you remember back in May, I fell in love with another of her jellies. She does these so well! I don't know why, because I generally hate blue, but I am in love with this one. 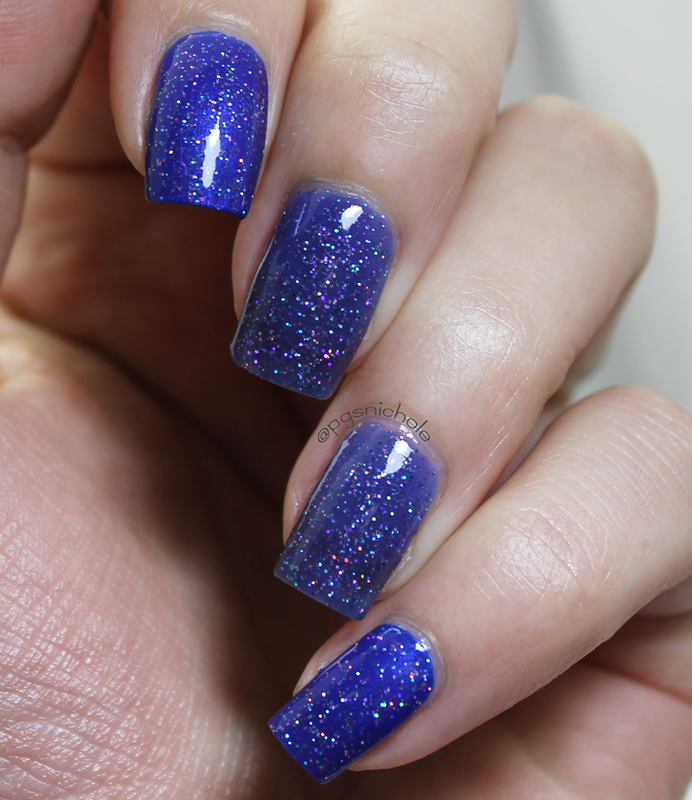 It is a soft cobalt jelly with holo micro glitters...and I love it. Pictured below on my index and pinkie is two coats over WnW Saved by the Blue (which is a pearly cobalt blue). It makes a fabulous topper, and makes that bright cobalt blue positively glow. On my middle and ring, I used just three coats of STS alone...and it is nearly opaque. I love polishes like this, because it gives you options. This stuff is sheer enough that it could be a transformative top coat, but somehow its pigmented enough that it can be comfortably built up...witchcraft I tell you. Man, I wish I had tried this over a pale gray. Dammit...hindsight. Anyhoo, this is a lovely blue and iridescent glitter topper that is surprisingly dense. 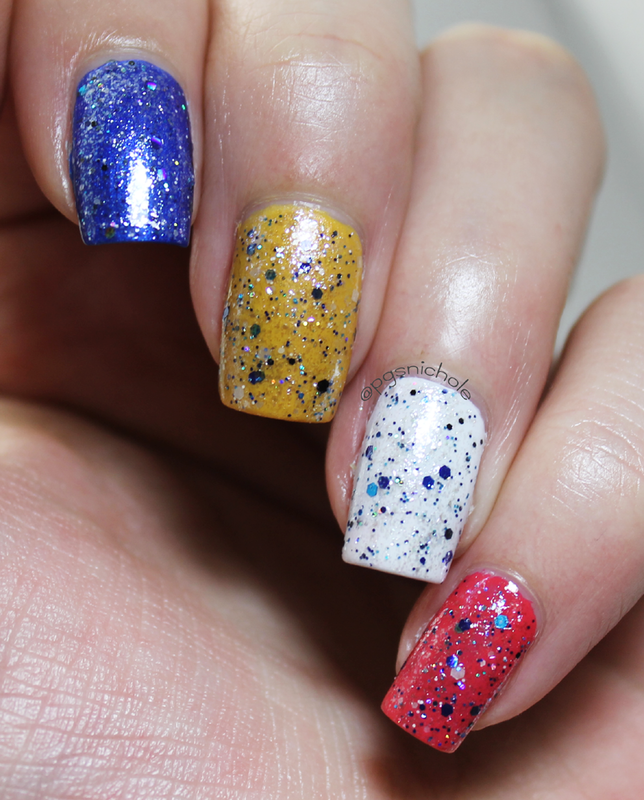 So much so, that I had to try it over four different colors just to see which glitters would show up. Honestly, I think I love it over white the best, but I bet it would look fabulous over a dusty orchid color too. This one is another home run in the formula category, which makes me happy. I was wholly surprised at how smoothly it dried, considering the insane amount of glitters...I honestly could have gotten away with no topper for these. I think this is a good glitter for everyone to have on hand. It might be the nicest glitter for the good ol' "PGS evolving nail" business. And there you have it, my first steps into Fall! Are you excited? I'm excited. If this is any indication, then Fall is going to be fabulous this year. I can't wait to see what else is coming.